Here is a link to a previous post, Sticker Cards, that I did showing how to make what I call sticker number cards. These are modeled after a deck of cards but because I make them with stickers and colored index cards, they can be made quite easily to go with the theme we are doing in My Obstacle Course. I love ideas or things that I can make and keep to use in a variety of ways to expand on concepts and skills as his knowledge and abilities expand. In the past I have used these cards to work on number order, one to one correspondence, “Make This Number” and addition. I was setting up a March themed course and after looking at things Andrew was ready to work on, I decided to use them as a visual aide in a station activity to see how he did comparing two numbers. When I first set up the station, I did not have the sticker cards but when looking at it I decided to include them so he could see what the number amount looked like. (You could also provide actual objects for them to count out. Any kind of manipulative works – dried beans, Cheerios, buttons, pennies, etc. If it can be counted out, it can be used as a manipulative!). I’m really glad that I put them out because he absolutely used them! 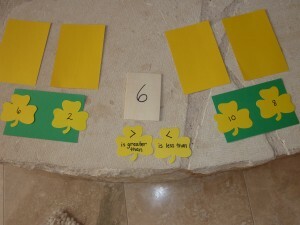 My Obstacle Course Station Activity: Decide if the first number is greater than or less than the second number. Flip the sticker cards over if you need help. 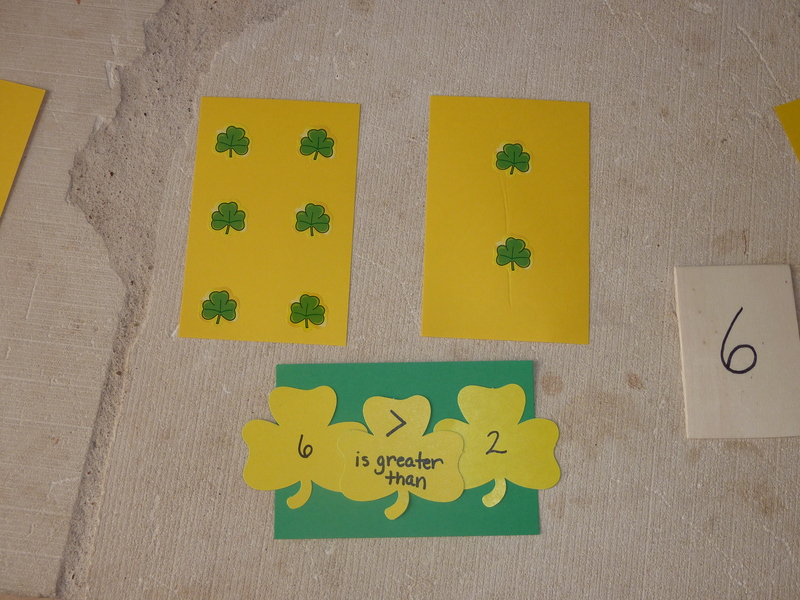 Sticker cards used as a "greater than," "less than" My Obstacle Course Station Activity. Note: During my educational courses in college it was always emphasized to incorporate visual, auditory and kinesthetic aspects to each lesson taught to make sure each learning style is reached. I find that this is so helpful when providing reinforcement activities for Andrew, especially when he wasn’t speaking and I had no idea what he knew or how he learned best. It doesn’t take much and does not have to be super fancy but taking the time to provide a visual, auditory and something they can manipulate is well worth it! I hope you are seeing this through the station activities that I am sharing and as always, if you have any questions or would like me to post on a skill or concept you are working on with your child, please email me at obstaclecoursemom@yahoo.com or post on my Facebook Page at My Obstacle Course.